With tomorrow’s continuous connections, Active Knowledge will be embedded in everything we do digitally, aware and ready to help us succeed. Embedded ecommerce will help us switch to what’s best. This 1-to-1 marketing channel skips search, eliminates ads and bypasses retail. When our needs are known, instant solutions will be part of everyday life, constantly elevating everyone to the top. The old model was physical retail stores. Get in your car, go to the store, find the products and learn about them by touching them and asking a salesperson questions. Pay the store’s prices. Today’s online e-commerce is on-screen. Use search to jump to the product, compare it to others, use reviews by customers and analysts, then find the best price and purchase. It’s spectacular for gift giving because presents are wrapped and delivered for you. It’s even better for price comparisons, which is immediate whether you’re online or in a store. Hours of work reduced to a few clicks. The entire product lifecycle will soon enter the marketer’s sandbox: After buying, from “receiving through configuring through using through servicing and upgrading” — every minute of the life cycle enters marketing’s touchpoints. Is the user having a problem? A gap? Yay! Every gap is an opportunity to make each customer the world’s best and happiest and greatest — during every minute he or she is using connected products or services. 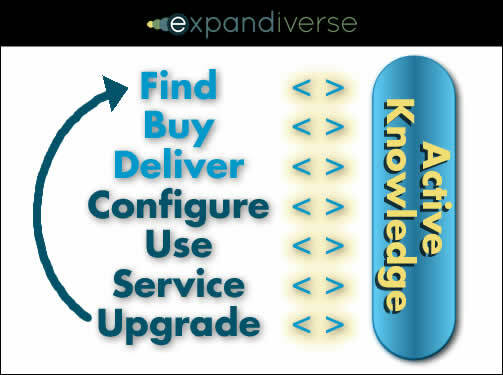 Active Knowledge will turn use into embedded commerce. Marketing will be redefined as full product lifecycle connections that are part of everything we do, aware of what we’re doing, knowing the gap between each of us and the world’s best, always ready to help everyone move up to what they want. After delivery, it shows you how to succeed while you use your new product or service, making satisfaction and success normal. If “the best choice” can be delivered digitally, then the user can move up immediately. Within a minute of being frustrated, you can turn that into the highest level of success. Embedded e-commerce will tailor itself to all the steps in the product life cycle, holding your hand when you want, making sure you get what you’d like. Image credit: The graphic is copyright Dan Abelow. Share the post "Next: Embedded through Life Cycles: Learning, Tools and Commerce Grow Aware, Ready to Help Everyone Succeed"